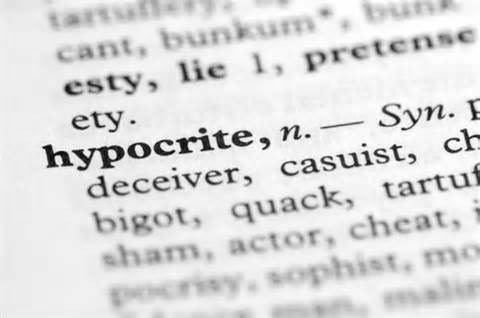 The realm of public education is filled with hypocrites. Although proponents of Common Core purport that the standards are not meant to dictate pedagogy or curriculum and teachers are free to do as they please, Coleman certainly has distinct ideas about what teachers should and should not do in the classroom in order to achieve pedagogical goals and, truth be told, fidelity to common core rests on following his authoritative stance to a tee. For instance, Coleman highlighted new ways of doing things under the Common Core: a shift to more nonfiction, informational texts and a push to do more teaching, class discussions and writing that are focused on extracting pure evidence from the four corners of the readings at the expense of any prior readings, experiences or ideas of the students or teacher. Coleman has criticized teaching practices including providing students context on what they’re about to read before they start, helping them with pre-reading strategies (such as predicting what a text will say), and asking students to focus on specific elements (such as the main idea, character or structure) as they read. He also criticized the movement to assign students “just-right” books. Teachers assign students reading material that fits their ability level, as a way to encourage them to read books that will challenge them without frustrating them. It is one of the signature features of the balanced literacy approach (as are the pre-reading and reading strategies that Coleman also dismissed), which school districts like New York City have adopted and popular curriculum models like Lucy Calkins’ Reading & Writing Project promote. Coleman has argued that students should be primarily reading complex texts that are matched to their grade-level, even if their reading ability is below grade-level. To help them keep up, he said teachers should use techniques like close reading, where students spend an entire class period focused on how one vocabulary word is used in the text, for instance. Instead of more general questions. sustained reading of complex text, beginning with Reading Standard 1. “A significant body of research links the close reading of complex text—whether the student is a struggling reader or advanced—to significant gains in reading proficiency and finds close reading to be a key component of college and career readiness. (Partnership for Assessment of Readiness for College and Careers, 2011, p. 7). Most educators would agree that it is important to build students’ capacity to comprehend a text through close reading. There’s some controversy, however, as to how to go about doing this. David Coleman suggests that educators restrain themselves from influence outside of the text by providing “text-dependent questions.” In this vein, Coleman and colleagues (Coleman & Pimentel, 2012) advocate asking a sequence of questions that will lead students more deeply into a text relying on the four corners of the page for context and information. Blogger Peter Greene notes, among other things, that Coleman’s perspective on reading literature is so tightly confined to reading within the “four corners” of a page that he misses the point and this practice may compromise the exercise and reading assignment. Oh, and Greene thinks Coleman is basically full of it. 2) Great questions follow the author’s lead. Coleman writes, and I am not making this up, “Good questions begin in humility.” What he means is that hat’s within the four corners of the text is more important than the best gesture of our gains. 5) Great questions provoke a sense of mystery and provided a payoff in insight that makes the word of reading carefully worth it. This one deserves some extra attention, because it reveals a level of Colemanism not always noted. Not only does Coleman assume there is only one pathway to truth, but he assumes there is only one motivation for traveling it. There’s only one way to feel as if reading a work carefully was worth the trouble, only one reason that people dive into complex texts and come out the other side being glad they did. Only some works are really worth reading, says Coleman, and there’s only one reason to engage them. 7) Some great questions do not follow these principals and may even break them. Well, there’s something I can actually agree with. Coleman repeatedly fails to distinguish between his own experience of the text and Universal Truth. Both Peter Greene and Professor Tampio raise excellent points. As a result of the myopic view advanced in common core, Coleman deprives teachers of the opportunity to teach beyond what is in front of them and students are prohibited the chance to draw their own conclusions or to draw upon factors that exist entirely outside of the text itself in order to understand a text. Is Coleman’s myopic vision realistic? Should students be limited to regurgitating facts in order to how that they comprehend a passage from the text? Should teachers be prohibited from providing students with contect and supports that students may need in order to grasp, fully understand and connect ideas dare they venture beyond the four corners of the text itself? Lindy Johnson is a doctoral student and an Assistant Professor at the College of William and Mary who specializes in critical discourse analysis. In a paper she wrote titled “David Coleman and the technologisation of the Common Core: A critical discourse analysis“, Johnson uses critical discourse analysis (CDA) to investigate Coleman’s standards, common core, how he comes across and how teachers interpret his words. 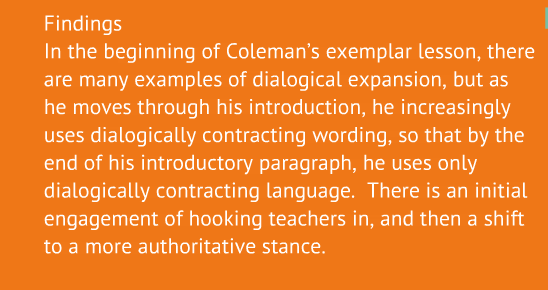 Johnson found that there are considerable contradictions between what Coleman espouses and what he actually does during the course of the model lesson evidencing that Coleman steps beyond the four corners of text himself. In other words, Coleman is a hypocrite. CDA is an interdisciplinary approach to the study of discourse that views language as a form of social practice. Scholars working in the tradition of CDA generally assume that (non-linguistic) social practice and linguistic practice constitute one another and focuse on investigating how societal power relations are established and reinforced through language use. Critical Discourse Analysis (CDA) has been used as a basic discipline in education to provide answers to questions about the relationships between language, society, power, identity, ideology, politics, and culture. Wherever there is a consolidation of knowledge, there follows a consolidation of power; when considering the Common Core State Standards in the United States, therefore, one is compelled to echo the question first posed by Juvenal, “Quis custodiet ipsos custodes?” or “Who watches the watchmen?” (1918, lines 347–8). The United States has seen a significant increase in the role of federal and state legislation in education. The most recent reform movement, the Common Core State Standards (CCSS), has been heralded by both Democrats and Republicans as a way to fully prepare American students to compete in a global economy. Although there have been vocal critics of the CCSS in the United States, and many literacy scholars have critiqued the standards movement, less attention has been paid to how language has been used to normalise the new standards (Collins, 2001). Indeed, some literacy leaders seem not to be examining the CCSS in ways critical discourse analysts would suggest is imperative. For example, inPathways to the Common Core: Accelerating Achievement, a popular book often used in teacher education and teacher professional development, Calkins, Ehrenworth and Lehman (2012) argue that there are two ways of viewing the Common Core State Standards: as a curmudgeon—or as if they are gold. A CDA framework provides a more productive alternative to viewing the CCSS because it provides a thicker picture of the processes involved in making meaning of how the CCSS have been produced, disseminated and consumed. In this excerpt, the CCSS claims authority (by listing all the stakeholders), and solidarity with the audiences (e.g., developed in collaboration with teachers, to prepare our children). 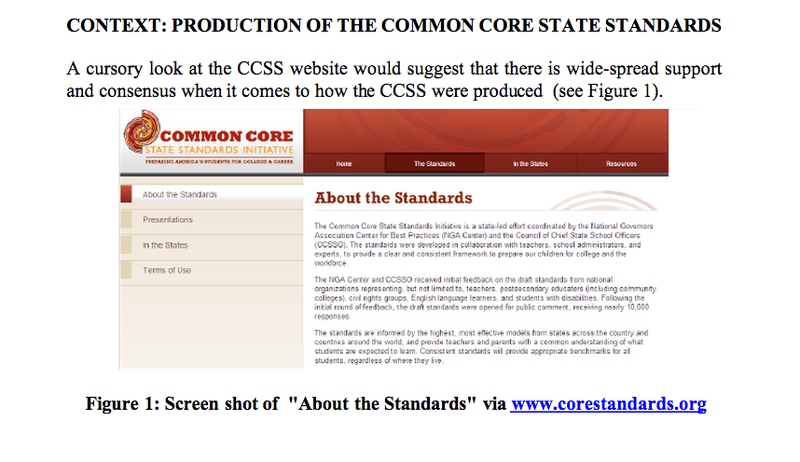 However, there is little transparency on the website about how the CCSS were produced. The CCSS website itself makes no mention of the primary funders of the Common Core (Achieve, Student Achievement Partners—all funded by Gates Foundation) nor David Coleman, who is essentially the architect of the Common Core. A simple Google search revealed a wealth of articles and links dedicated to examining how the CCSS were produced. In short, the authors of the Common Core are also those who are producing textbooks for the Core as well as providing consulting and professional development services. 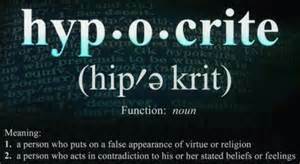 The authors of the Common Core therefore have deep-seated financial interests in the shape of the program. Furthermore, the simple consolidation of so much ideological capital in one corner of the information industry greatly limits local district and teacher autonomy. But the Gates Foundation isn’t the only institution attempting to stake a claim, ideological and financial, in the future of American education: several authors of the CCSS are employees of Pearson. “In 2008, the Gates Foundation announced that it would develop its own set of national standards accompanied by its own national test (Green, 2008). Originally, the Gates Foundation stated that it would make a national test available to states at no cost, but as the Obama administration embraced the national standards, the offer to make the tests available at no cost disappeared. My analysis of Coleman’s presentation demonstrates what Wodak considers the aim of CDA, namely to “[make] contradictions transparent” (1999, p. 186); it shows that there are considerable contradictions between what Coleman espouses and what he actually does during the course of the model lesson. Coleman says he wants to begin by “attacking the three most popular ways of beginning [to read]” (see Appendix, line 59): activating background knowledge, pre-reading strategies, and setting a purpose for reading. He critiques teachers for wanting to begin by providing background information to orient students. Instead, Coleman advocates that the text itself should be the only “source of motivation” (see Appendix, line 252). He argues for decontextualisation of the text, by eliminating background information or providing even a summary of the Birmingham letter. Yet he then brings his own knowledge of Aristotle and Greco-Roman mythology to bear on the text. Apparently some context is fine, provided it is comes from an ancient and privileged source, whereas information about the immediate historical context of the Birmingham letter is out of bounds. Coleman then advocates doing away with pre-reading strategies such as making predictions, comparing the letter to other texts (with which students might be familiar), and even connecting the substance of the letter to students’ own experiences. Instead, he argues that teachers should consider, “dispensing for a moment with all the apparatus we have built up before reading” (see Appendix, line 83). Coleman then compares the act of reading to watching a film, and asks teachers how they would feel if “[he] ruthlessly interrupted [them] as it unfolded?” (see Appendix, line 183). But then Coleman himself goes on to ask a number of questions as he works through King’s letter. For example, he asks his audience: “What are the three very different arguments King makes for why he’s in Birmingham? And what different kinds of evidence does he use to support them?” (see Appendix, line 155). He also asks teachers to explore historical connections and allusions as they see fit. Finally, he argues that teachers should stop setting a purpose for reading, or what he calls “the strategy of the weak” (see Appendix, line 90). Instead, Coleman urges teachers to let “King set the agenda” (see Appendix, line 95). He emphasises that the text itself “creates an appetite” (see Appendix, line 206) in the reader; and that the “mysteries” (see Appendix, line 251) of the text itself will create motivation and purpose. Coleman does not seem to be aware of the many kinds of experience and knowledge he brings as a reader, experience and knowledge that makes the “mysteries” of the text legible as mysteries in the first place. These do not strike him as his own impositions but rather as some impersonal or neutral field of information emerging spontaneously from King’s text. He apparently does not see how the kinds of questions and ideas he finds worthy of comment are themselves “activated” in the text by his own training. A reader without that training—one who, for example, had no background in Western philosophy and was therefore insensible to Aristotelian allusions—might instead be drawn to entirely other questions, or at any rate frame them differently to Coleman. Coleman sets a purpose for reading, he asks questions of the reading, and he brings his own background knowledge to bear on the reading. You can read the full CDA analysis here.